Grace Cossington Smith began painting at a young age. She painted scenes from everyday life in the city of Sydney, where she lived. Views from the city, interiors and still lives were among her favorite motifs. Her brushstrokes, short and square, made her known as the first post impressionist artist of his country, but her style became more modernist with time. She liked to use lots of colors and patterns and this make her paintings still vibrant and appealing. After returning from a holiday in England, 1st World War broke out. The following year, she painted The sock knitter. 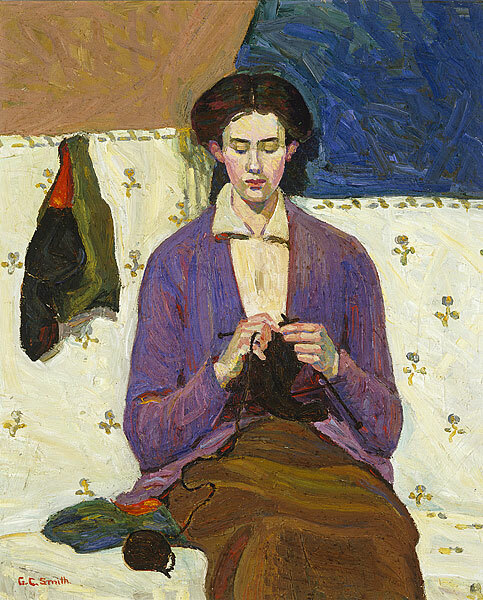 This work shows her sister Madge knitting socks for Australian soldiers who fought for the Allies on the European front. In this context, many civilians helped the Allies by small actions, sending cards, food or blankets. The painting shows us the reality of war, but from a personal and intimate perspective. The fact that the title of the painting doesn’t include her sister’s name is not random: Smith preferred the portrait to be anonymous. Thus, The sock knitter serves as a tribute to all the people that sympathized with the Allied cause. ~ by Álvaro Mazzino on March 16, 2012. What i do not realize is actually how you’re noow not really a llot more neatly-appreciated than you mmay be now. angles. Its like men aand women are not interested unless it’s something to do with Woman gaga! This entry was posted on March 16, 2012 at 12:39 and is filed under Art nouveau, Impressionism.You can follow any responses to this entry through the RSS 2.0 feed.You can leave a response, or trackback from your own site.